1st day of school for Benji! August has brought a change in life. 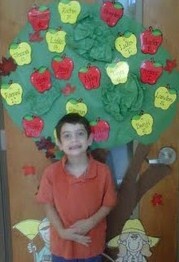 Started first grade at the beginning of the month. It is very different from kindergarten. On August 11th I went back to the dentist again. I did NOT like it. Both mom and the dentist tell me that the "habit-breaking" appliance is good to do. The dentist said it might prevent me from having to get braces. All I know is that I do not like it. (What I did like is that I got to eat applesauce and pudding for a few days. Mom even made her chocolate homemade pudding.) Oh! I also lost a tooth on the 7th! This past week I had to go in during recess because while I was outside running and playing my heart hurt. (I think it's just I get going so fast that I get tried, plus it is really hot outside.) I told mom and she says to let her know if it happens again. She seemed worried about it. It must be because of the bicuspid aortic valve with stenosis. Since then, mom is limiting how much I am outside and making sure I drink a LOT of water. I also went to a birthday party for my friend Lilly. She is so cute! She likes me and I like her, but I do not want a girlfriend, I just want a friend. At her birthday party she had a bounce house and I really liked playing in it! We had a lot of fun. And now we start a new week. I already know it will involve a lot of Tae Kwon Do because I didn't get to go last week with our crazy schedules.